The internal shieldedinput transformer provides galvanic isolation with provisions for nominal 208 VAC, 3-phase inputvoltages. Special EMI/RFI filters and input power factor correction minimize both input current and harmonics. The inputcircuit breaker and the isolation transformerprovide an isolated source for all installations including shipboard systems oroverseas locations where phase references and grounding are not consistent. 50or 400 hertz outputs are available as an option. 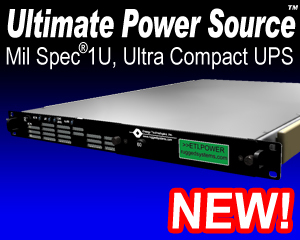 The unit can also operate as a frequency converter, taking 46-70 hertz input and converting it to clean, uninterruptible 60 hertz power. The LED arrays keep the operatorinformed as to the unit's status including load and battery levels. Thehigh intensity audible alarm can be heard in high noise environments. Allcontrols and protective devices are brought to the front and rear panels with critical switches having finger guards. The front panel also provides easy access to both the AC Input and Battery Input fuses. Coupled with the onboard spare fuses, MTTR is reduced to less than 15 minutes. Further, all front panel devices are recessed toprevent damage or accidental operation. Theinput circuit breaker and the galvanic isolation transformersall provide a double pole isolated source for all installations including shipboard systems oroverseas locations where phase references and grounding are not consistent. The rear panel provides locking connectors for the inputand output power. Removable, washable air filters combined with high capacity stainless steel ball bearing fans provide added protection in both controlled and hostileenvironments. The exhaust air is diverted out the rear vents, withalternate air flow directions optional. The external battery connector allows the safe and easy addition ofthe standard or extra battery modules without having to shut the unit down.The batteries are maintenance free with immobilized electrolyte and are constructed of flame retardant materials. For more information, see the Battery Technology section. TheStatus connector provides an interface with optional computer softwareproviding loss of AC and low battery status as well as remote shut down capability.